Space officials in Europe and Japan are considering plans tobuild and launch additional indigenous cargo ships to the International SpaceStation if the program is extended beyond 2015. Although NASA has only budgeted for station operations until2015, the independent Augustine commission recommended continuing the programthrough at least 2020. "The Augustine commission made that recommendation, sowe're waiting for our government as well as the governments of the otheragencies, who have a great interest in seeing the extension of theInternational Space Station program, to get maximum use of their modulesextended beyond 2015," said John Uri, NASA's lead scientist for thestation. If the station's life is extended, more cargo missionswill be necessary to serve logistics needs for crews aboard the outpost,according to Bernardo Patti, ESA's space station program manager. "It's clear from the Augustine commission that theywant the station extended beyond 2015," Patti said. "That wouldrequire more logistics services for ISS." Four more flights of the European Space Agency's AutomatedTransfer Vehicle are planned through 2015. Six more Japanese H-2 TransferVehicle missions are also on tap through the rest of the station program. "We may have more (ATVs) after that," Patti said. "It just depends on how long the station is operating and its needs." Japanese officials may also ask for funding to flyextra HTVs to the station, but their request may face steeper opposition. "We hope to increase the budget for the researchers andalso the H-2B and HTV for the future of our space missions. Right now, we arediscussing in the Japanese government about the future plan of our nextgeneration for future exploration and also the ISS extension," said NaokiNagai, deputy director of the Japanese space agency's Houston office. 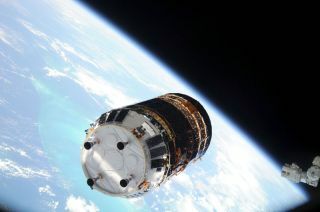 A Japanese government panel has singled out the country'sspace program for potential budget cuts. The Government Revitalization Unitspent more than a week screening budget requests of Japanese governmentagencies and advised reducing funding by 10 percent for the HTV program. The tight budget environment could make it difficult forJapanese space officials to expand the agency's mission portfolio, includingadding more HTV missions or upgrading the spacecraft. The unit price tag for each HTV is around $200 million,excluding the cost of the H-2B rocket. An ATV spacecraft costs about $300million, not including the Ariane 5 rocket or mission costs. Patti said he hopes more ATV spacecraftcan be procured if the station operates past 2015. A senior-level meeting ofrepresentatives from ESA member states is scheduled for late 2010 to set theagency's budget priorities for the next few years. "We will ask for more funding for additional ATVs ifthat happens," Patti said. ESA is already studying modifying the ATV with a heat shieldto return equipment from the space station. Next year's Ministerial Councilmeeting could also decide whether to implement such a program. ATV cargo ships are manufactured by EADS Astrium in Bremen,Germany. The HTV spacecraft is built by Mitsubishi Heavy Industries. The European and Japanese ships have each flown to thestation once, completing highly successful maiden flights to test out theirdesigns and deliver supplies to the complex. The ATV and HTV can haul food, water, air, propellants,spare parts and science experiments to the space station. More Russian Progress freighters and U.S. commercial supplyflights would also be likely if station activities continue until 2020.